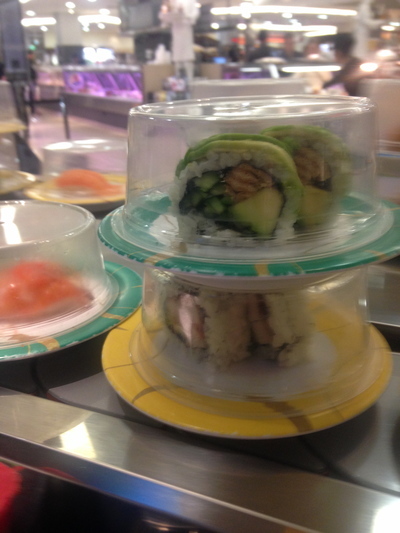 Welcome to one of Sydney's simple but swankiest sushi bars - the Sushi Bar at David Jones Food Hall. When you think of David Jones Food Halls, you think quality and freshness. Then again, David Jones Food Halls at Market Street in the city is the next best thing to Harrod's in London. A combination of local and imported ingredients are used in their foods. Having tried their oyster and noodle bars in the past, it was now time to try their sushi bar. There was an occasion I was at David Jones for a work function last year, and I was first introduced to the Prawn Tempura ($9.95) available here, yet (at the time) I was not a raving fan. There was way more batter than prawn, and left me feeling quite empty afterwards. I've enjoyed a few of their sashimi kits (large $14.50) to take away, yet I wanted to sit down, enjoy and get a feel for an actual sushi train experience here. A couple of days ago, I had a golden opportunity to do such. It is a blow to grab your drinks from another section opposite the train, rather than enjoy full drinks service. The only full service drink they provide here is the Green Tea ($2.50) - and then again, it is presented in a paper cup. No thanks. I want to eat fairly civilised, even thought the chopsticks were paper based. At other sushi trains, you get water for free, whereas here you to pay for it. 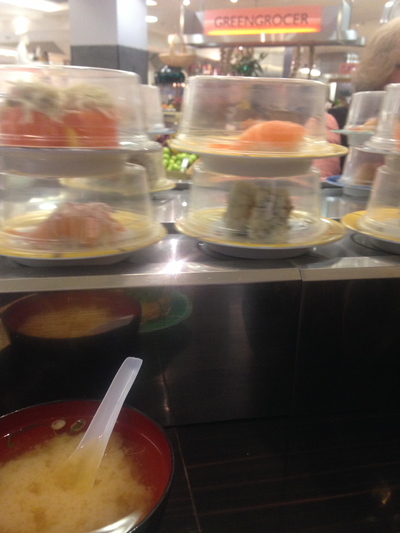 So glad to have ordered the Miso Soup ($2.50), and picked up the Seaweed Ship ($4.50) off the conveyor belt. The food was definitely fresh. The temperature of the soup was just right, and did not taste powdery at all. It started to fill me up, even though the seaweed dish most certainly did. 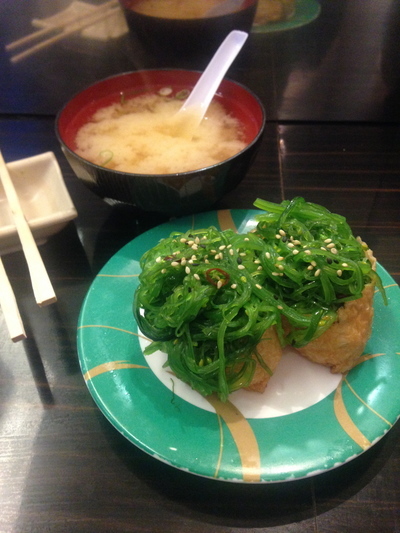 With the Seaweed Ship, I took the seaweed off the top and ate the rice and gyoza bit first. I needed some soy sauce to bring a little bit of sweetness to this dish. The rice was quite filling, but surprisingly not starchy. 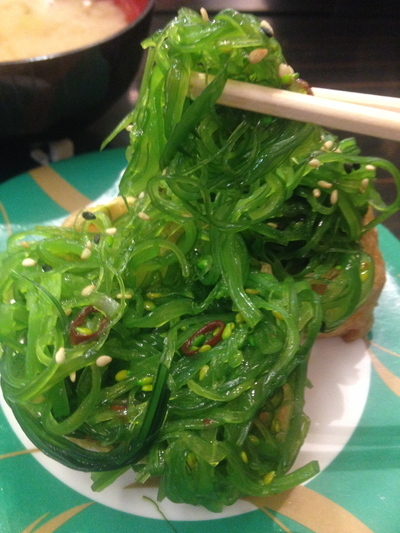 The seaweed was the best I've tasted in a long time. Fresh, clean, spicy and flavoursome. The service was polite, and you definitely don't feel rushed here. Worth trying at least once. 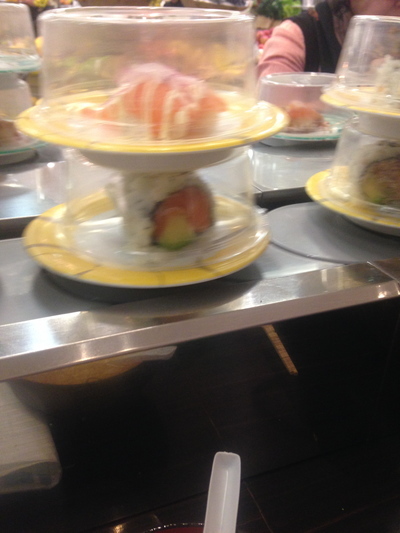 Although the sushi dish seemed expensive, yet it definitely filled me up. I had to pass on some salmon and avocado. NB: lovely readers, the image I had of their prawn tempura previously is on my USB stick, of which I left at the office. I'll upload to this article tomorrow. Cheers, Justine. Where: 65-77 Market Street Sydney NSW. LG level - David Jones. 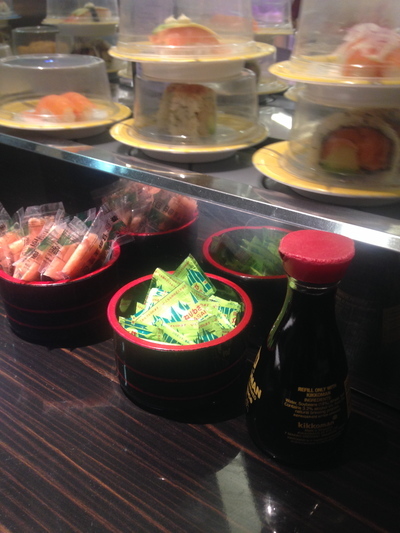 Why: Fresh and filling Japanese treats. When: During David Jones Food Hall operating hours. 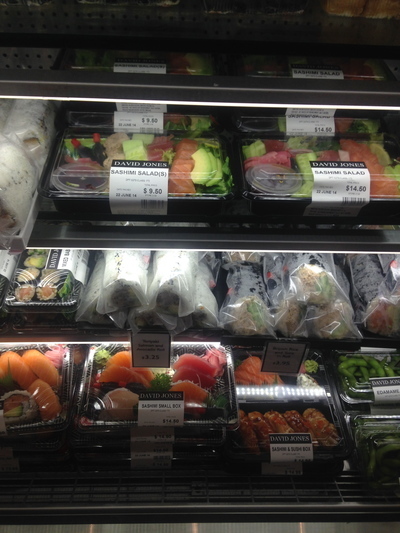 Take away: Yes, for seaweed, sushi rolls and sashimi.